Congratulations to Yidi Sun on her new paper! Yidi Sun‘s new paper is out now as an electronic publication ahead of print in the journal Molecular Biology of the Cell. Congratulations to Yidi on her great work! The abstract is below. The PDF can be downloaded from MBoC here. 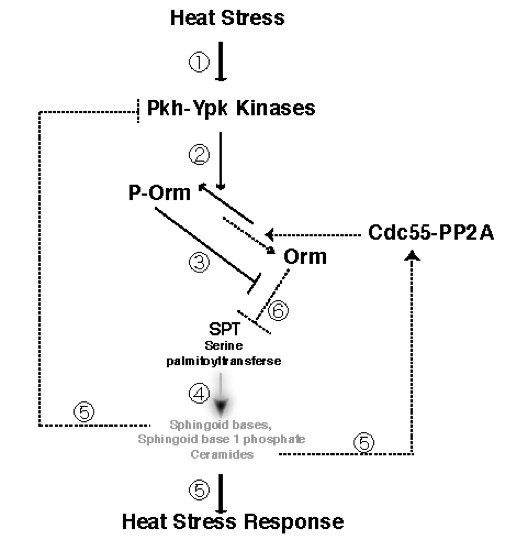 Orm protein phosphoregulation mediates transient sphingolipid biosynthesis response to heat stress via the Pkh-Ypk and Cdc55-PP2A pathways. Sun Y, Miao Y, Yamane Y, Zhang C, Shokat KM, Takematsu H, Kozutsumi Y, Drubin DG. Mol Biol Cell. 2012 Apr 25. PMID: 22535525. Sphingoid intermediates accumulate in response to a variety of stresses, including heat, and trigger cellular responses. However, the mechanism by which stress affects sphingolipid biosynthesis has yet to be identified. Recent studies in yeast suggested that sphingolipid biosynthesis is regulated through phosphorylation of the Orm proteins, which in humans are potential risk factors for childhood asthma. Here, we demonstrate that Orm phosphorylation status is highly responsive to sphingoid bases. We also demonstrate by monitoring temporal changes in Orm phosphorylation and sphingoid base production in cells inhibited for Ypk1 protein kinase activity, that Ypk1 transmits heat stress signals to the sphingolipid biosynthesis pathway via Orm phosphorylation. Our data indicate that heat-induced sphingolipid biosynthesis in turn triggers Orm protein dephosphorylation, making the induction transient. We identified Cdc55-PP2A (protein phosphatase 2A) as a key phosphatase that counteracts Ypk1 activity in Orm mediated sphingolipid biosynthesis regulation. In total, our study reveals a mechanism through which the conserved Pkh-Ypk kinase cascade and Cdc55-PP2A facilitate rapid, transient sphingolipid production in response to heat stress through Orm protein phosphoregulation. We propose that this mechanism serves as the basis for how Orm phosphoregulation controls sphingolipid biosynthesis in response to stress in a kinetically coupled manner. This entry was posted in News and tagged announcement, congratulations, heat shock, membranes, metabolism, molecular biology, news, phosphorylation, signaling, sphingolipids, stress response on April 29, 2012 by NateKrefman.